Following the great success of the Dortmund Data Bank (DDB) for mixture data (phase equilibria, excess properties, ...) and the models developed on the basis of these data (UNIFAC, mod. 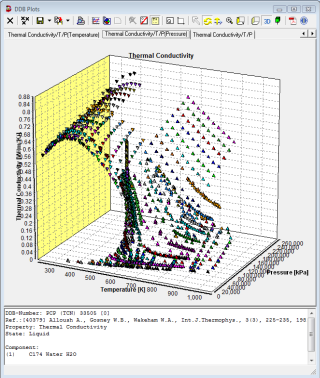 UNIFAC, PSRK, VTPR, LIQUAC, ...), the development of a pure component database (DDB-PCP) was a further step to supply the industry with the required experimental data, reliable predictive methods, reliable correlation parameters and modern software for the correlation and estimation of thermophysical data. In cooperation with research groups in different countries and financed by the German and Austrian federal ministries for research and technology all worldwide published data are collected and stored in a factual database. In contrast to other collections, also East European and Asian literature is carefully evaluated, especially with respect to deposited documents. Since 2001 DDBST maintains the data bank, only the Estonian group is still entering some additional data, mainly from sources published in Russian. The DDB online search provides a statistics showing all the available properties together with the number of components for which data are available, the number of sets, and the number of points.